We just came back after a vacation to India. It was a special one because we had not gone in 2 years and the last time we went, Adith was 2 years old and had just 3 sounds – a, ee and ka. He was speaking a lot more now and I was eager to see how he was going to communicate with my family members. The clarity of his speech is still an issue with him having difficulty with ‘s’,’f’,’l’ and almost all of the blends but there was no stopping him this time! I was literally stunned by his confidence in dealing with people. In the flight, he was saying to the air hostess ” I want red juice” (he means coke :D), ” I want water” etc. and while in Kerala he had no inhibitions talking to anyone – young or old. The fact that another language was being spoken there did not bother him at all. Both Loveson’s parents and my parents made efforts to speak in English and made Adith at ease. Of course, ” I don’t want to eat” turned out to be the winner sentence being said several times a day. Considerable amount of time was spent in watching cartoons dubbed in Tamil and Malayalam (?) but I had to let him just be so – it was vacation right? Several days after we reached, while at Loveson’s house, he decided he wanted to sleep with Ammamma(Loveson’s Mom). I think he thoroughly enjoyed getting all of the attention from his grandparents. As soon as he was back after an outing, he would announce “Ammamma, I want Orange juice” and mummy would gladly oblige, once even leaving her lunch halfway! When we reached my house, right on the second day he announced he was sleeping with Appacha(my Dad). That seemed to be the out-of-way adventurous thing to do! ” I want cutlet and ketchup”, ” I want to go to the playground”, “I want to go to the bakery with Appacha” – he was definitely communicating and making his wishes known with no trouble. There were very few times that I had to pitch in and I was really happy with the way things were going! With the blizzard coinciding with our date of return, we were stuck in Chicago for 2 days and while having dinner one night at the hotel’s dining room, a toddler boy came up to Adith’s chair and held onto it. He was babbling and seemed interested in Adith’s company. Adith leaned down towards him, still seated on his chair and said “Little boy, you need to stay with your Daddy and Mommy, ok?”. Loveson and me exchanged glances and smiled. Seeing that the little boy was not heeding his words, Adith turned to look at his dad and called out “Daddy, daddy, your little boy is coming to me”. The poor father hurriedly came over and took the boy away. I felt a little awkward and told him “Da, he just wanted to play with you!”. Adith gave me a sort of wicked smile. He had initiated a conversation with someone whom he had not seen before! There, my little birdie was slowly flapping his wings and getting ready to take off! Previous Post Up, Up, Up, Dump! Next Post From Kakka to Pappa..a journey of 18 months. Fly adith fly! Take wings and explore this wondrous world! Thanks for your time Sapna Chechi! 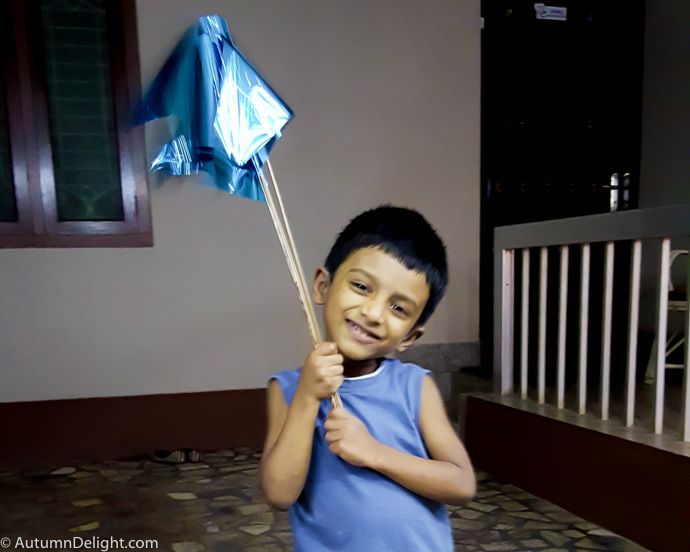 Diyappa your little birdie man is definitely going to make you proud of him! I must say, I’m not surprised of the detailing, for what was just a violet-salwar for we roommates, used to be a lavender-shaded-tiny-yellow-flowered-cotton-patiala for you! And yes, that’s what makes it so refreshing. Glad you started writing.. should have started a long time back girl!